New Mum? Struggling to find the time and motivation to get back to exercise? Not exactly sure what to do and how to do it? Then you’re definitely not alone. 1. START SMALL – I think it can be really tempting when you’re getting back to exercise to want to go straight back to what you were doing before. We all want to feel like we’re getting a result, and so feel that we need to be exercising a few times a week to make progress. However, when you’re just starting back, the most important thing is setting up that good habit again. I see way too many women who aim high and then get frustrated when they can’t get there. Which ends up stopping them in their tracks altogether. While there’s nothing wrong with aiming high, if ever there was a time to be super realistic, it’s now! It may not sound like a lot, but even if you manage 3x 20 minute sessions a week to start with that’s a great starting point. It’s something that pretty much all of us can manage, which means you’ll end the week with a sense of achievement, plus its enough to be able to start feeling some of the good effects after just a couple of weeks. Not only that, but you’re gradually welcoming exercise back into your life and starting to set up a habit now that you can build on when the time is right. 2. BE CLEAR ON PRIORITIES – There’s no doubt about it, when you have a baby your priorities change. For good. There is now a small person (or small people) to consider in literally everything you do, from going to the loo to taking a trip to the supermarket, to having a night out with friends. And it can have a big impact on your priorities – what was important to you before, suddenly gets a lot lower down the list. Exercise is one of those things – because unlike doing the washing, caring for a baby, doing the shopping, making dinner and the myriad of other things you’re having to cram into your day, exercise can always be done tomorrow. Which means we often end up leaving it for days and days and days and never getting it done. Which can be a real source of frustration and anxiety for a lot of women. You remember back to your old gym going self, feel the need to get fit again and yet, somehow, struggle to muster the motivation or time to do it. And that’s because your priorities have shifted massively. So, before you start anything, ask yourself where your priorities in each day lie. If your priorities are to do all of the other things and then fit in exercise at the end of it, that’s absolutely fine. But it does mean that it’s fairly likely that the exercise won’t get done. However, if you know that exercise is one of your priorities for the day, make it that way. Don’t be tempted to do that load of washing and tidy up first, leave that until later and get the exercise done first. What I’m saying is that your priorities are your priorities. If exercise comes way down the list, then accept that rather than beating yourself up every time you say you’ll do it and you don’t. But if it is really important to you, then make sure you treat it as such by making it one of the first couple of things you do in that particular day. 3. PLAN, PLAN, PLAN – I’m a big fan of planning. I strongly believe that in order to achieve certain things you have to have intention behind it and you have to know exactly what you’re doing to get there. Which is as true of getting fit as it is of anything. This ties in to my 2nd tip about being clear in priorities, because making a plan for your day or week will help you to be clear on what you need to do in order to make exercise and healthy eating happen. Sit down on a Sunday night with your diary and think about where you can make the time to exercise – don’t expect time to jump out and grab you…you need to actually create that time. Have a think about gaps in your week and when the baby will be napping (or when someone else can look after the baby for an hour, for example) and then PUT IT IN THE DIARY. 4. DON’T BE TOO HARD ON YOURSELF – We may have just had a baby, we may still be recovering from the birth, and we may be sleep deprived, but that doesn’t stop us from being hard on ourselves. We still expect ourselves to keep up with the things we know we would like to do – the healthy eating, the exercise, and anything else you fancy throwing into the mix. But being hard on yourself and expecting too much can just end up being counterproductive. It can make you feel like you’re constantly coming up short and not getting anywhere close to achieving the things you want to. Which just adds stress to your day and makes you feel bad about yourself. None of which is actually conducive to getting healthier and fitter again. So, know that whatever you’re doing, you’re already doing an AMAZING job – you are caring for a baby (and quite possibly older kids as well) and that alone is a really tough job. If you’re not quite eating as you would like or doing the exercise you want to, it’s not worth getting mad with yourself. You will get where you need to be if you take your time and are consistent, but remember that beating yourself up really ain’t going to help! 5. BLOCK OUT THE NOISE – When I talk about blocking out the noise, what I mean is, stop comparing yourself to others. Stop looking at social media and comparing yourself to the mum who got a flat tummy within 3 weeks of the birth. Stop comparing yourself to your super fit friend who’s already out running again and is looking amazing. These people are not the norm. And they’re probably dealing with their own stuff that you may not even realise. What appears from the outside is only a very very small part of the story and ultimately, whatever they’re doing has absolutely nothing to do with you. We all have to write our own stories. We all have to do what’s best for US, and for each and every one of us that will be something very different and very individual. You have to slow down, take your time and be mindful of all aspects of your health and wellbeing – body and mind. Looking outside and getting dragged into the ‘noise’ can easily just make you feel worse, so focus on you and your recovery. 6. BE CONSISTENT AND DON’T EXPECT OVERNIGHT CHANGE – Be honest, have you ever started a new fitness regime, with that certainty that in a few weeks you’ll look and feel completely different. With the hope of a brilliant quick fix where you can work hard for a while to get where you need to and then take your foot off the pedal for a bit? I think we all have at some point. But the thing with fitness is that it’s all about consistency and sometimes change can be slow. Remember that you’re in this thing for the long haul and that means making fitness a part of your life, now, next week and next year. The changes don’t always happen quickly, and sometimes you have to be consistent for a really long time before you see the results of all your hard work. But don’t let that put you off – start by focusing on how the exercise makes you feel, as its guaranteed to make you feel better just by doing it. The other stuff will come over time. 7. TEAM UP WITH FRIENDS – sometimes there’s nothing harder than going it alone. And I’m sure we all have like minded friends who would love to get back to fitness but struggle to find the time and/or motivation. So think about joining forces. Make an appointment to go for a long walk together, because then you’ll feel bad if you skip it and let your friend down. Take it in turns to look after the babies while you each do a session in peace. Or just get together for a workout where the babies can play and you can work out with a bit of company. Whatever you choose, doing it with someone else will always give you that extra push of motivation that you might be needing! 8. FIND THE RIGHT TRAINER OR CLASS – last but not least, there’s nothing like getting the professionals in. 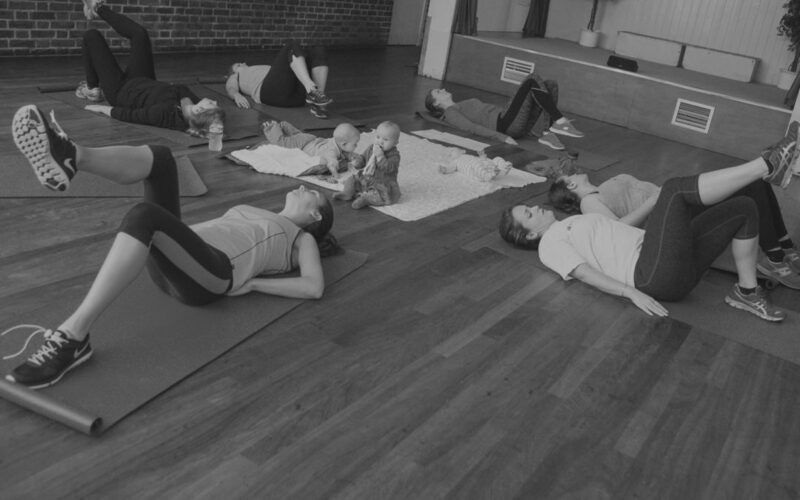 Find a good local class that will give you a weekly workout that’s safe for new mums, because working out in a group and having pre-paid for your sessions can be a pretty great motivation. Or if you want something a bit more flexible, or have particular needs such as working on an abdominal separation or pelvic floor dysfunction, investing in a good trainer who has specialist knowledge in that area can be invaluable. It might seem like a lot of money, but compared to spending the next few months totally unsure about what do to, lacking in the motivation or direction, or worse, suffering with post birth issues that could easily be resolved, it’s usually money really well spent.